On October 1, 2014, I began Day 1 of my first attempt at the Digestive Health with REAL Food elimination diet. Let me tell you people. It was intense. INTENSE. Like seriously, I started hating meal time. I hated that I had to eat. I was eating plenty of healthy foods and getting plenty of nutrition, but it wasn’t the food my body had grown accustomed to. I was used to snack bars, lattes, potatoes, rice, chips, and diet soda. And suddenly I found myself eating countless numbers of chicken breasts and pot roasts and green beans, but no conventional starches allowed on the side. And seriously, I thought I was going to lose my mind. These crazy intense cravings would attack my body. I’d sit at a friend’s house and look at her little bowl of M&M’s and want to pull my hair out or just pour the whole bowl down my throat. I would have killed someone for a chewy gluten-free cookie. At night, I would have to leave the kitchen after dinner time and not return, or the anger and cravings that would fill me as the night progressed would turn me into a crazy woman. I didn’t know if I could make it through. But guess what. I did. And the diet worked. Aglaée Jacob knows her stuff. It took six weeks, but my digestive symptoms disappeared. Bloating, jabbing pains, nausea, gas, abnormal bowel movements - GONE. And, to my shock, my symptoms from my undiagnosed autoimmune condition also vanished. Brain fog, hair loss, dry eyes, dry mouth, severe fatigue, anxiety - GONE. Within 2 ½ weeks on the diet, my blood ANA (indicator of autoimmune disease), which had been fairly high just prior to starting the diet, DISAPPEARED. It seemed almost miraculous. The doctors had no clear answers as to how it could have happened. I was elated. The doctor at my rheumatologist follow-up appointment, when I received the news that my ANA was gone, told me that the only thing abnormal in my blood work was some ketones. She shrugged off the ketones, saying she didn’t know why they were there. But I did. I knew it was because I’d cut the sugar and carbs, I’d put my body into ketosis, and I was healing. The diet was working. Even though I wouldn't experience relief from my symptoms for a couple more weeks, I had hope. Fast forward five months. I’m now about to start the diet over. Yes, I’m for real. And no, I can’t believe it either. See, at first I did awesome at reintroducing foods slowly, at documenting my response to them. But it seemed that everything that I tried to reintroduce made me sick. After a month or so of struggling with failed reintroductions, I saw a GI doctor and got diagnosed with small intestinal bacterial overgrowth (SIBO, to be explained in a later blog post) and fructose malabsorption. Everything in my diet went haywire after that. I (mistakenly) thought that since the doctor gave me antibiotics for my SIBO, maybe I could eat more foods. I started reintroducing too many foods too quickly. I researched what types of diets I needed to eat for SIBO and fructose malabsorption, and focused on eating within their realms, hoping that I could bypass all the slow reintroductions of foods one at a time. Meanwhile, we were dealing with a ton of health and food allergy issues with my son, and I found more and more of my energy going into his diet instead of my own. Before I knew it, I’d lost total control of what I was eating. I’d quit journaling my food intake and symptoms, I’d quit focusing on nutrient dense foods, and in the chaos of everything I was even sneaking in frozen fish sticks and packaged gluten-free cookies again. And boy, did I pay for it. I am now almost back to square one. Not as sick as I was the beginning of October, but getting close. All of the symptoms I used to have returned. The only difference is that they aren’t as severe yet. But if I keep eating the way I’m eating, they’ll get there. It’s time to do a rewind. Fortunately this time, I have a new friend through a friend who is going to do the diet with me. (Yay Misti!) And I’m really excited about that. :) She also has tons of digestive issues and autoimmune symptoms (yay for her!). I can tell already that she’s going to be a great accountability partner and help me push through when I feel like giving up. I hope that we can support each other through this and come out victorious on the other side. 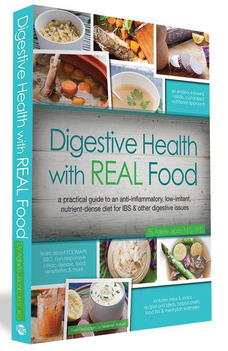 For anyone reading this who is struggling with digestive issues, I can’t recommend Aglaée’s book enough. She shares valuable information on almost every possible digestive issue and explains all the ways that food, diet, and lifestyle can impact your digestive health. And then she lays out for you her suggested elimination diet. The idea is that you reduce the foods that you’re consuming to only those that she has researched and recommends. You stay on those foods until you notice that your symptoms have mostly subsided. Then you add foods back one at a time, in the order you prefer, watching for any immediate or delayed reactions you might have. Over time, you are able to pinpoint exactly which foods are causing you issues and which foods are safe, and then you end up with a varied, healthy diet that is right for you. I’m not going to give all the details of the very basic diet, but it essentially boils down to meats, poultry, fish, green beans, zucchini, spinach, carrots, and some healthy fats and seasonings. Algaée also gives a lot of suggestions for how to eat these foods and provides many recipes in the back of her book. 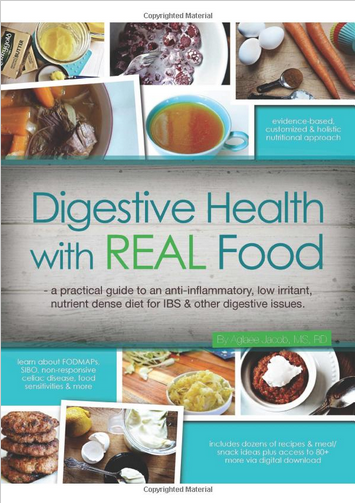 She’s also written a companion cookbook, Digestive Health with REAL Food: The Cookbook, which I also own and use quite often. I’m planning on starting the diet tomorrow, I think. I am not looking forward to it. However, I am super excited to feel healthy and have energy again, and also to not have abdominal pain and bloating every day. So I know it’s totally worth it.